Best Solution has been available throughout North and South America since 1986. Clearly unique and different from all other products. Best Solution stands alone in restoring your jewelry to its original condition. Contains NO acid, ammonia or abrasives. Safe on ALL jewelry, including pearls, opals, diamonds, turquoise, jade, emeralds, platinum, silver, gold and costume jewelry. 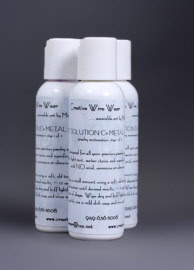 Metal polish is exclusively designed for all your precious jewelry metals and more. 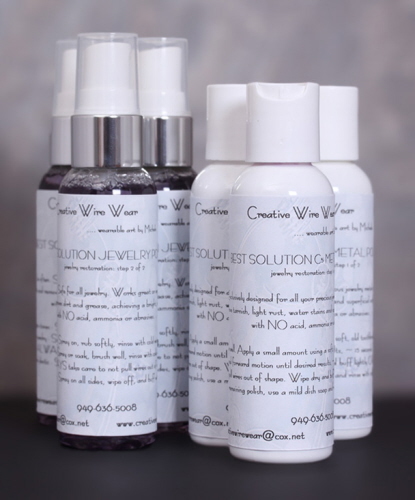 Removes tarnish, light rust, water stains and superficial surface scratches. 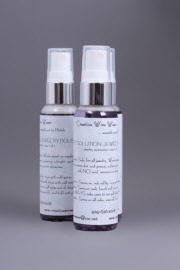 Jewelry polish absorbs and removes dirt and grease, achieving a bright, sparkling finish. Additionally, eyeglasses, glass and plastics will not steam or fog, fingerprints or smears can be reduced or eliminated. Jewelry polish can be used alone OR as the second step, following the metal polish, in a 2 step jewelry restoration system. Both products available individually OR as a set. Each contains 2 fluid ounces of product.